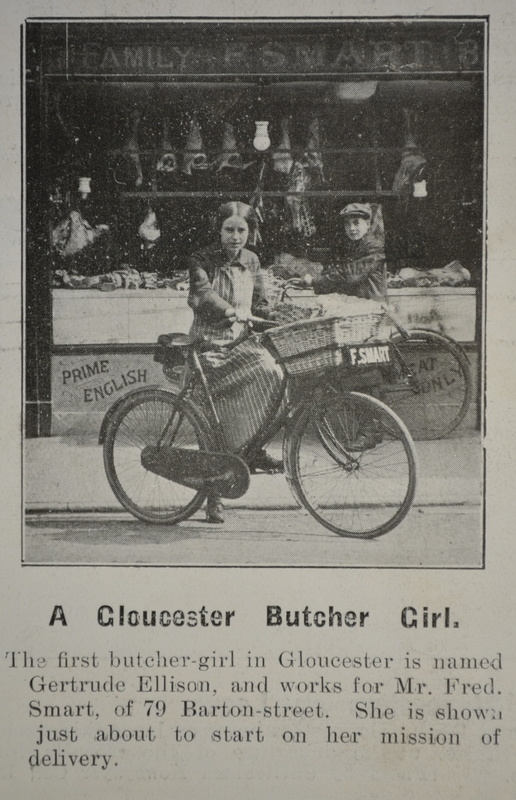 The photograph below shows Gertrude Ellison, Gloucestershire’s first butcher girl, who was employed by Fred Smart of 79 Barton Street. 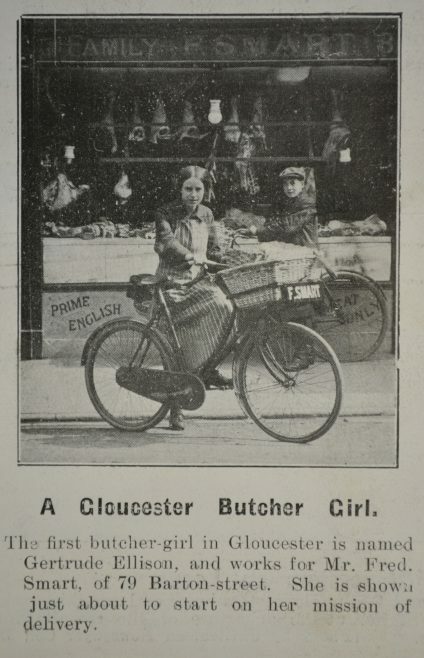 The photograph is taken from the weekly Cheltenham Chronicle and Gloucestershire Graphic (the edition of 4th September 1915). Back copies of the Graphic are held at Gloucestershire Archives. The 1911 Census return on www.ancestry.co.uk shows Gertrude as being then 12 years old and one of five children of Joseph and Louisa Ellison, who in 1911 lived at 2 Wheatstone Villas, 20 Tudor Street. Joseph is shown as being a foreman in a timber yard, presumably in the Bristol Road, while Gertrude was then at school. Smart’s Gloucester and District Street List of 1914 shows the family still living at 20 Tudor St, so presumably Gertrude’s working day started and finished with a cycle ride to and from Barton Street. You can see a larger version of the image by clicking on it. We are grateful to Dave Bailes for identifying this item.